One perk of being a cancer kid, I get to eat whatever I want, and no one gets to tell me no. Permalink: One perk of being a cancer kid, I get to eat whatever I want, and no one gets to tell me no. Owen: I miss you. I miss us. I don't need time. I need you. Amelia: What took you so long? Permalink: I miss you. I miss us. I don't need time. I need you. You did it. You stepped up. All right, well, don't get too swelled up about it. But great work. Good job. I can play the cancer card all I want because I'm the one with the damn cancer, and talking to both of you makes it true! Maggie: You do not want to go in there. There's a big storm. A big, big storm. Permalink: You do not want to go in there. There's a big storm. A big, big storm. I told people who could help! Permalink: I told people who could help! Jo: Hey, thanks for marrying me. Permalink: Hey, Thanks for marrying me. Maggie: I"m saying you can waste a lot of time waiting for the right moment. Bailey: That storm's gonna come when it comes. Permalink: That storm's gonna come when it comes. My mother did the same thing. She hid her cancer from me, tried to protect me, and all I can think of is all the time we lost. Non-brain tumor Amelia is a reasonable surgeon who asks reasonable questions. Permalink: Non-brain tumor Amelia is a reasonable surgeon who asks reasonable questions. 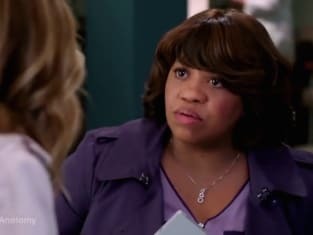 Mer: And you couldn't say that in the E.R? Link: I guess I could, but I didn't realize my job was me convincing you that I belong here. Permalink: I guess I could, but I didn't realize my job was me convincing you that I belong here.